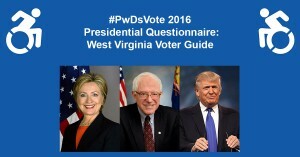 Washington, May 9 – As voters head to the polls in West Virginia tomorrow, RespectAbility released its West Virginia Disability Voter Guide. There are 368,983 West Virginians with a disability, 187,400 of whom are of working age (between the ages of 21 and 64). There are an additional 7,000 people ages 16-20 with disabilities, many of whom are hoping to enter the workforce. West Virginia’s voters are looking to know where the candidates stand on important disability issues in order to increase opportunities for competitive, integrated employment for people with disabilities. 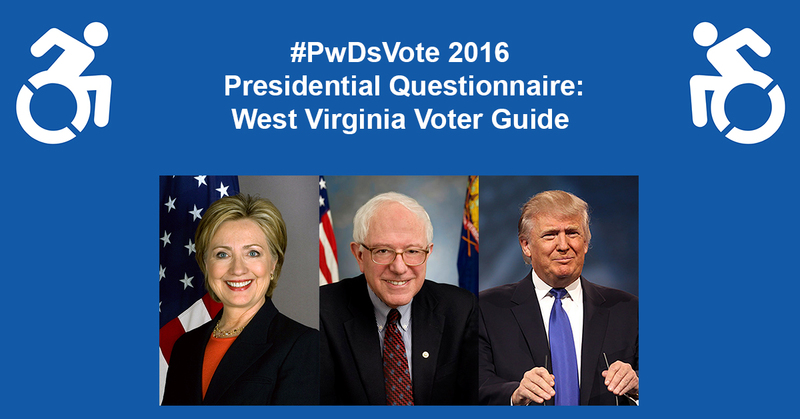 The #PwDsVote 2016 Campaign Questionnaire was designed for people with disabilities (PwDs) and those who love them to know where candidates stand on the issues. The questionnaire asked all of the presidential candidates on both sides of the aisle to comment on 16 disability questions. Former Sec. of State Hillary Clinton and Sen. Bernie Sanders responded by addressing all of the questions. They each have significantly different views on the issues. Despite numerous requests in person and by phone and email, presumptive Republican nominee Donald Trump has not yet filled out the questionnaire. However, several Republican candidates who have since dropped out of the race did respond to the questionnaire including former Gov. Jeb Bush, who addressed all of the questions, and Dr. Ben Carson, Gov. Chris Christie and Gov. John Kasich, all of whom filled out parts of the questionnaire. West Virginia currently has a 25.6 percent labor force participation rate for people with disabilities, the lowest currently held in the United States. Other states, such as the Dakotas, have values almost twice as high as West Virginia with 50 percent of their populations with a disability successfully employed. View the rankings of all 50 states and compare. West Virginia has a lot of ground to cover and faces significant barriers in terms of encouraging more people with disabilities to pursue employment. Some West Virginians want the meager amount of money that comes from benefit checks, and there have been instances of fraud where people have claimed a functional impairment in order to get on disability. RespectAbility has submitted comments for all 50 state’s drafts of the Unified Plan as required under Section 102 of The Workforce Innovation and Opportunity Act (WIOA). In reviewing West Virginia’s Unified State Plan, it can be determined that West Virginia also faces significant economic challenges as manufacturing, mining and farming decline. WIOA offers a chance for West Virginia to jumpstart and improve its economic and employment opportunities for people with disabilities. The West Virginia state plan does much to emphasize the critical importance of apprenticeship programs. In particular, that emphasis directly references training opportunities for West Virginians with disabilities. The West Virginia Division of Rehabilitation Services reports that it is already providing services that will allow individuals with disabilities to avail themselves of work-based learning. Further, the state plan commits to promote the development of registered apprenticeship programs with a focus on non-traditional industries and occupations. Both of these notions are encouraging, as many people with disabilities can find apprenticeships as their doorway into employment. However, there is still much room for improvement in West Virginia’s current WIOA draft if they wish to achieve better employment rates for people with disabilities. The gap in the labor force participation between people with and without disabilities is 44.9 percent. This lack of employment for people with disabilities creates poverty, powerlessness and poor health. Polls and studies show that people with disabilities want the opportunity to have the dignity and independence that jobs provide. RespectAbility will continue to urge Cruz and Trump to submit their ideas for the disability community. When they do so, we will update the guide. The questionnaire is being distributed to more than 50,000 people who care about disability issues, more than ten thousand of whom live in the early primary states and the heads of more than 100 national disability organizations, many of whom will share with their own lists. RespectAbility also has placed online ads sharing the questionnaire.